Goldman Sachs, which despite the occasional foray into sports handicapping is in fact an investment bank, behaved like one today, reporting second-quarter earnings [PDF] of $1.78 a share, or $927 million. That was better than analysts expected, but worse than last year, when it made $1.05 billion. 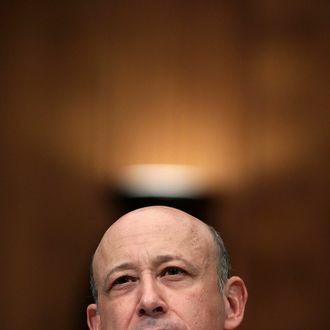 Although Goldman has, for years, been rumored to be a shadowy political entity, a vampire squid wrapped around the face of humanity, and a tool of the Illuminati, the bank proved today that it is definitively a publicly traded Wall Street firm — one that advises companies, provides banking services, buys and sells various financial products in order to make money, and reports its earnings on a quarterly basis. In reporting its earnings — an event that used to make Wall Street watchers titter with anticipation — Goldman did not announce it was plotting an overthrow of the global financial system, appointing the next chairman of the Federal Reserve, or driving Spain into bankruptcy. Instead, it spoke of arcane concepts like “Tier 1 capital ratios” and “expense reduction initiatives” and reported that it, like other Wall Street firms, has made less money than in previous years because of the crisis in Europe and a slowdown in global capital markets activity. Once thought to have its hands in every bit of global malevolence, Goldman has failed to keep up with its peers in recent months. JPMorgan Chase, the once-cuddly yang to Goldman’s fear-inspiring ying, has been engulfed in a trading loss imbroglio, while Wells Fargo, which was once as unremarkable as a bologna sandwich, paid at least than $175 million to settle a lawsuit over claims it had discriminated against minority borrowers. Adding to the disappointment of conspiracy theorists everywhere, Goldman is not among the dozen-odd banks that are being investigated over an alleged effort to rig Libor, an interest rate that affects trillions of dollars in securities. Today, the Wall Street Journal even reported that Goldman is “building an in-house bank to lend money to wealthy people and companies,” a basic financial service that will make it more like every other large Wall Street bank. Could it be that the era of Goldman Sachs as linguistic shorthand for the general concepts of malevolence and fraud is over?